Samsung is one of the frontrunners of active tech and the company has just launched two exciting new fitness focused products: The Gear Fit2 and the Gear IconX. Firstly let’s take a look at the Samsung Gear Fit2 – a smartwatch which is the genetic successor to the original Gear Fit released in 2014. 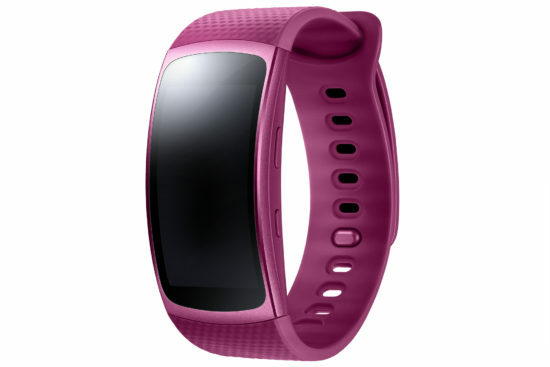 With a sleek and stylish redesign and a choice of funky colours including pink and blue (or more discrete black), the Gear Fit2 comes out of the box with 1.5-inch Super AMOLED screen which offers a resolution of 216 x 432 – compact but still enough for present you with all the vital info. And what’s also nice is that time the screen sits much more flush with the strap, and is less obtrusive than the previous gen model – this thanks to Samsung’s recent innovations with curved display technology. The Gear Fit2 runs Samsung’s own Tizen OS but is compatible with smart devices running both this and Android 4.4. It includes a Dual Core 1GHz processor with 512MB of RAM with 4GB internal storage. Heart Rate Monitoring (HRM) and built in GPS distance tracking, accelerometer, gyro and barometer and the usual arsenal of health metrics are included as expected. as well as notification alerts from your mobile. A highlight of the gadget’s features is its intelligent Auto Activity Tracking meaning there’s no need to manually start to Gear Fit2 when you start a workout, whether it be a run, cycle, swim (it’s waterproof to up to 1.5m for 30 minutes) – it’ll just start when you start. The smartwatch will also work independently from a smartphone and will sync all your fitness data from Samsung’s own S Health and other supported apps via Bluetooth 4.2 connection and will also play your music without need to strap a phone to yourself. The Gear Fit2 will hold enough charge for two to three days’ worth of workouts with a 200mAH battery which can be replenished on the charging dock. The Samsung Gear Fit2 will be released for sale on June 10th costing $179.99 with pre-orders being taken now through Amazon. Leg it over to the second article in this two-parter to find out all about the Gear IconX!